Weep Now or Weep Later | Masonry Technology, Inc.
Inset A. shows sash cord weep protruding from wall with no evidence of weeping. Inset B. shows weep hole with no evidence of weeping. Efflorescence indicates some moisture has leaked out through mortar joints. 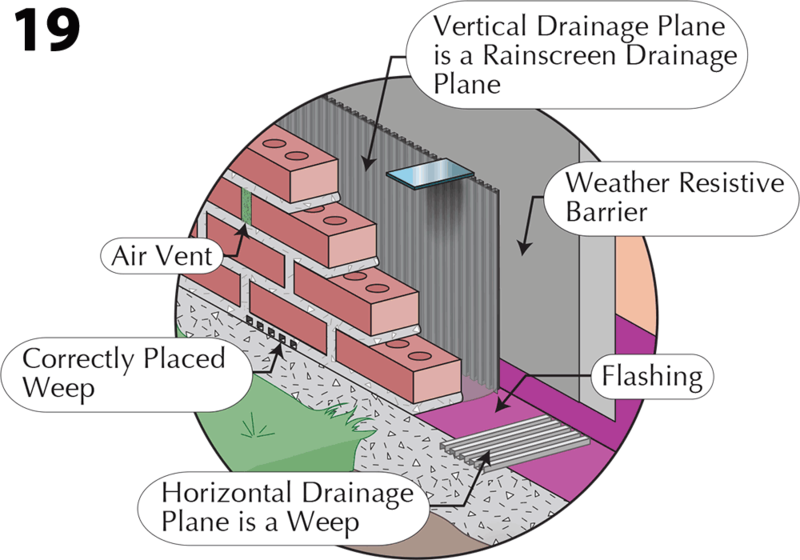 Weeps are also incorrectly placed - they are not at the lowest point of the wall! Introduction Thirty years ago I applied for, and was issued, my first patent, a utility patent for a weep system. The main “claim” of the patent was the forming of the bottom side of a bed joint of mortar to create tunnels or channels into the cores or cavities of masonry walls. In the process of researching information for the patent’s content, something became very apparent; many of the masonry industry’s accepted “rules of the road” or “standard practices” for weeping a wall had no scientific basis! The spacing of weeps 16” or 32” or 48” on center is one example of a common practice without scientific support. Obviously, this spacing pattern is modular, but modular and moisture-management have no scientific correlation that I can find. 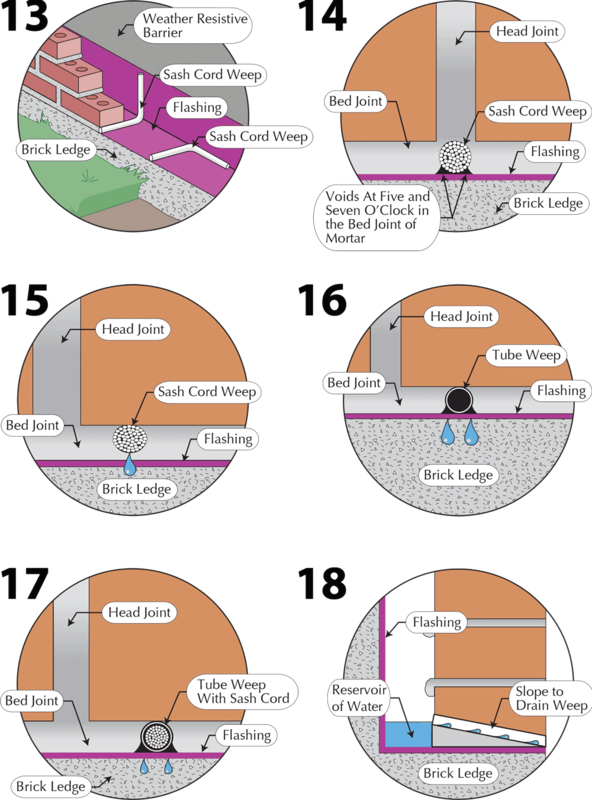 There may be code that specifies a certain spacing (International Residential Code R703.7.6 Weep holes and International Building Code 2104.1.8 Weep holes), but that doesn’t mean there is research to support that code. Some things are just done long enough that they become standard practice. If it was done in the past, it must be right, so why change it? With the old weep technology and its spacing, the water got out of the cavities and cores of masonry walls; however, it wasn’t necessarily through the weeps, it wasn’t necessarily all the water, and it wasn’t necessarily a fast process. (see #1 above and insets A. and B.) Moisture management in masonry walls, or in any other construction detail, is about getting the water away from, off of, and out of the construction detail as quickly as possible. The amount of “time” that moisture is in, on or near a construction detail is in direct proportion to the amount that will be absorbed into the materials that compose the construction detail. 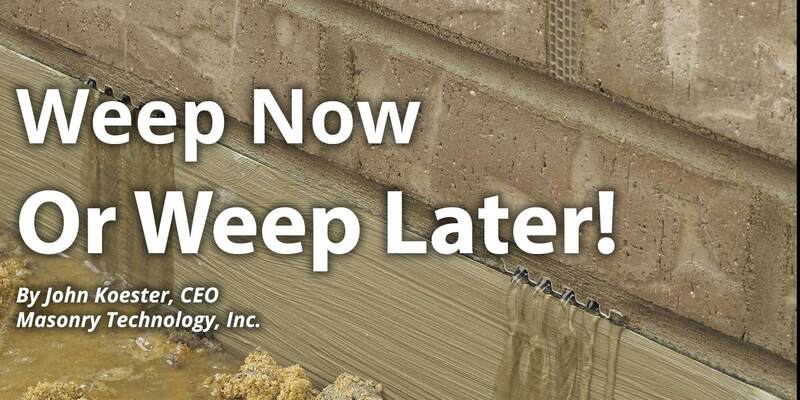 There is a need to repeat the obvious; a weep device should create an opportunity for the liquid water that has drained down to the top surface of a flashing to exit the core or cavity of the masonry wall on the top surface of the flashing. (see #2) Unfortunately, the masonry industry has in some cases incorrectly adopted the use of head joint air vent material and devices as weeps. (see #3 & 3A) A number of unfortunate conditions have occurred because of incorrect uses of materials and devices. The bed joint of mortar needs to be spread. A masonry unit (brick) is laid. Displace mortar to allow for weep placement. The air vent material is placed. A bed joint of mortar needs to be respread in front of the air vent material. A masonry unit (brick) is laid to the air vent material and into the bed joint of mortar. 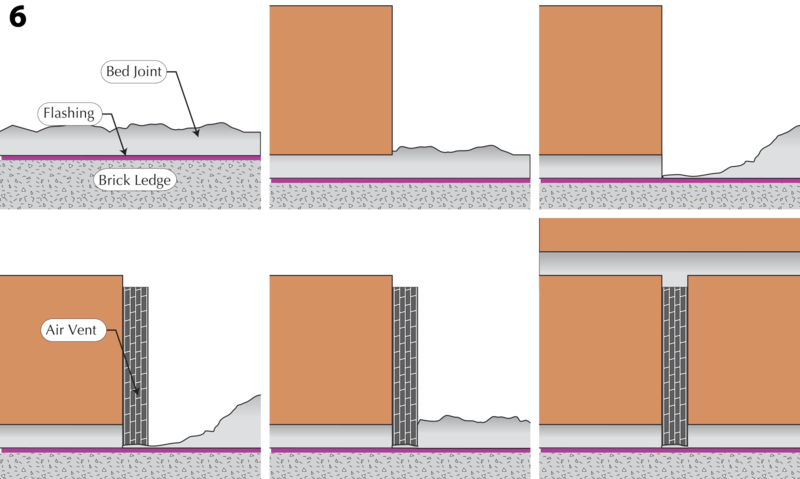 Improved airflow in the core or cavity of a masonry wall if equal air intakes and air exits are provided at the top and bottom of the wall. This will have “some” positive impact on the masonry wall’s ability to dry out. It should be emphasized, however, that the ability of masonry cavity airflow to dry out or remove moisture “is extremely limited!” Do not expect this airflow to effectively remove or alleviate any type of ponding water condition. That is the job of a well-designed weep system. One of the first weep details that was commonly employed was the sash cord or “rope” weep. (see #13) In some cases this detail was expanded with sections of the sash cord laid in the cavity and then extended through the wall, usually at a head joint. In other cases the sash cord was fastened vertically up the backside of the cavity. In yet other cases, it would be pulled out of the wall leaving a hole through the head joint or bed joint of mortar. How and when these sash cord sections were placed or embedded in the bed joint of mortar impacted whether or not they had any weeping capacity. If they were placed on the flashing and the bed joint of mortar was spread on top, the finished detail looked like this. If the bed joint of mortar was spread and the sash cord section was laid or embedded into it, the finished detail looked like this. (see #15) The theory was that the cotton sash cord would “wick” water out of the core or cavity and dry the units. However, if there is one takeaway from this article, let it be this, “Do not get into a wicking contest with masonry mortar or masonry units!” How can a sash cord of less than 3/8” in diameter compete with the wicking capacity of all the masonry units and the bed joint of mortar? A variety of tube weeps have also been introduced to the masonry industry. (see#16) These tube weeps are usually pieces of plastic pipe cut to length. The installation procedure is virtually the same as the sash cord material and so are the shortcomings. Even when the tubes are installed correctly on the top surface of the flashing, the wall thickness of the weep, though small, is still a water dam. Why would water elevate itself enough to get up and over the edge of the tube wall when it can just wick itself into the mortar and the other components that make up this portion or an exterior building envelope? To improve on a bad idea, the masonry industry has taken two dysfunctional weep products and created a tube weep with a sash cord in it! (see #17) And as difficult as it is to grasp, there is actually a “slope-to-drain weep tube sash cord product.” (see #18) Understanding how this “weep concept” could be correctly installed so that it could function is beyond comprehension! How can the construction industry be so uninformed that it would even entertain the notion that these products could actually weep a wall? 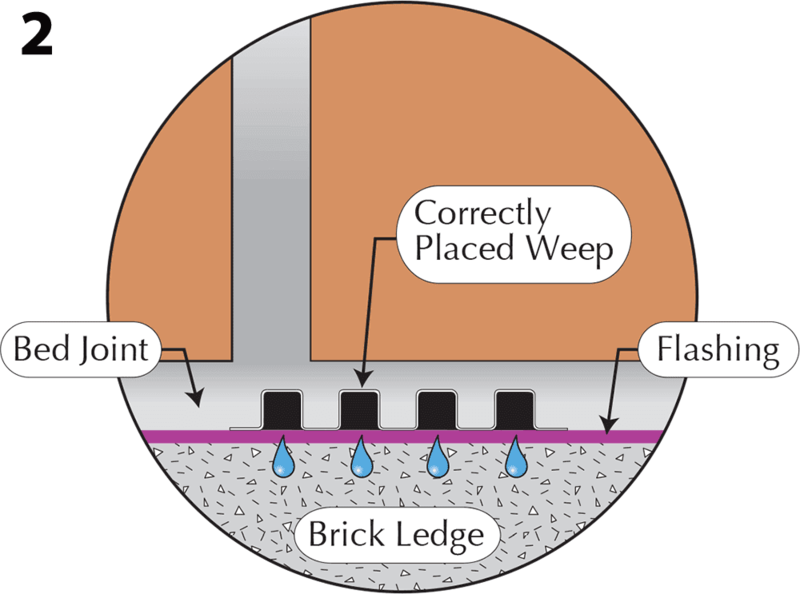 Another important message is that, “Weeps do not work until the water gets to them!” It is critically important that the cavity or core (the void behind the veneer) is open and clear of obstruction to allow liquid water to move from a high point of entry to the lowest point of the cavity or core, which is the top surface of the flashing. Renowned architect R. Buckmaster Fuller said, “People should think things out fresh and not just accept conventional terms and the conventional way of doing things.” This line of thinking is certainly relevant when it comes to conventional weeping products and practices. This article has presented concepts and techniques that go against the grain for many in the masonry industry; however, if adopted and practiced, the outcome is a more sustainable building envelope and a more aesthetically pleasing facade.